The Last Jedi is the longest entry in the entire Star Wars saga, yet it still didn't include answers to many questions fans have had since The Force Awakens. One of the mysteries the film avoided was the fate of the Knights of Ren, who served as Snoke's most lethal soldiers, led by Kylo Ren himself. Writer/director Rian Johnson was interested in these characters, but couldn't find a way to justify addressing them in this latest film. The filmmaker might not have found a way to work the characters into his own movie, but he sounded excited at the possibility of J.J. Abrams exploring them in Episode IX. The Knights of Ren wasn't the only mystery left unexplored, as Johnson also never gave audiences insight into Supreme Leader Snoke's background. “In this particular story, it’s much more like the original trilogy, where with Snoke if you think about the actual scenes, if suddenly I had paused one of the scenes to give a 30-second monologue about who he was, it would have kind of stopped the scene in its tracks, I realized," Johnson told the audience during a BAFTA Q&A. "Even though it could have been interesting, something that fans were interested in, as storytellers, we have to kind of serve what the scenes need to be." He added, "It was a tough thing, even though I knew some fans were interested in it I also knew it wasn’t something that dramatically had a place in this movie." Much like his enthusiasm for the Knights of Ren, Johnson didn't rule out a future film exploring Snoke's backstory. For now, audiences will have to settle for whatever our imaginations come up with for the Knights of Ren and Snoke. 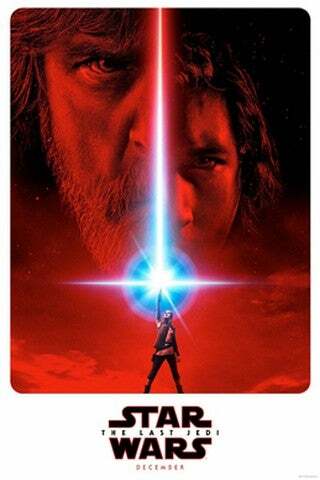 You can see The Last Jedi in theaters now.